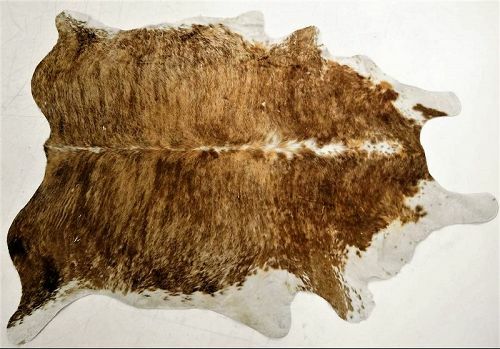 DESCRIPTION: A light brown and white pony hide rug, the soft fur longer than that of traditional cowhide. Wonderful for throwing over a sofa in your Southwestern home or Northwestern lodge, or toss it on the floor for a soft floor covering. Good condition. 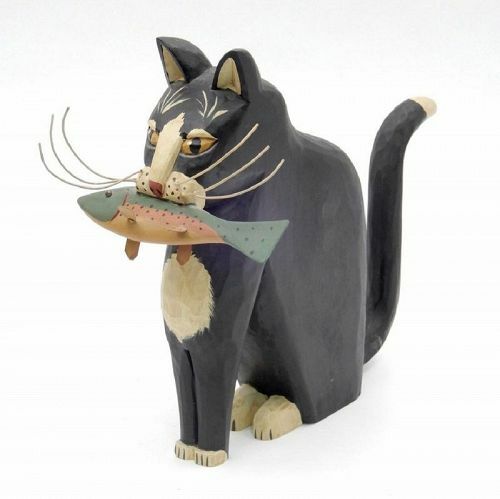 DIMENSIONS: 84” X 68"
DESCRIPTION: A charming folk art sculpture depicting a seated blue & white cat holding a fish in its mouth under its long, curved whiskers. By Pennsylvania contemporary folk artist and sculptor, G&G Hosfeld; artist signed and dated on bottom, "G&G Hosfeld, 1983, Souderton, PA." Excellent condition; a warm and whimsical accent piece for your farmhouse, country or lake cabin décor. DIMENSIONS: 8 1/4"wide x 11 7/8" high x 4 1/2" thick. 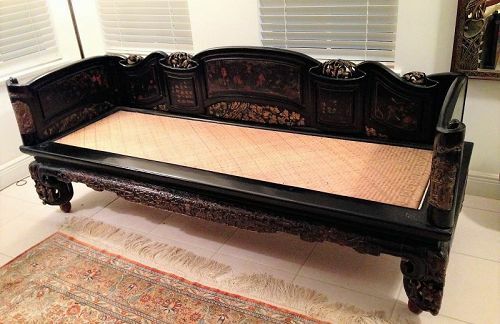 A Fine Chinese Lacquer and Carved Gilt-Wood Opium Bed, Qing, 19th C.
DESCRIPTION: A rare and beautiful Chinese daybed or opium bed (also referred to as a lady's couch bed, lohan, or "ta" bed), the black lacquered wood back and side panels shaped as an unfurled scroll with elaborate decorations including figural scenes, animals, flowers and birds, Chinese poetry and pierced gilt carvings. These surround a rectangular support frame topped with a woven mat seat. Below the seat an elaborately carved skirt stretches between thick, boldly carved legs. 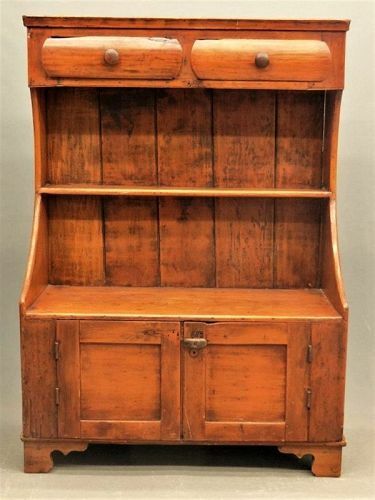 DESCRIPTION: This early to mid 19th c. high-back pine bucket-bench, or cupboard, is a graceful and highly unusual piece of American country & primitive furniture. With shaker-like sensibility, this utilitarian piece would have been at home in the foyer where you could sit while taking off snowy boots, or in the kitchen used as storage for crocks of grain and other staples, or on the covered porch by the entry where you could place groceries or packages while opening the front door. 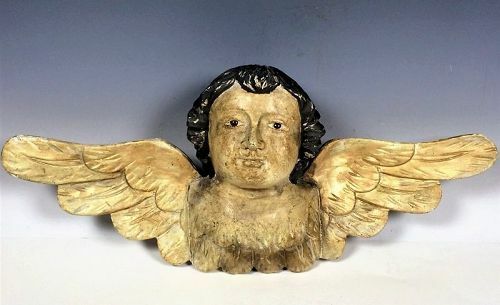 DESCRIPTION: An engaging carved wood santo figure of a winged cherub, most likely carved in the Philippines. This figure, dating from the early 1900’s, is depicted with black hair, inset glass eyes and extended wings. CONDITION: Some age appropriate losses to original paint. DIMENSIONS: 6.5" high x 16" wide. DESCRIPTION: A framed Japanese scroll painting of an ox in black ink on beige rice paper. A poem is inscribed in loose strokes at the top portion of the painting and is signed at the bottom by the artist, Kano Eigaku (1790 – 1867). Attractively framed with an archival silk mat in a faux black bamboo, the painting is in good condition and dates from the first half of the 19th C.